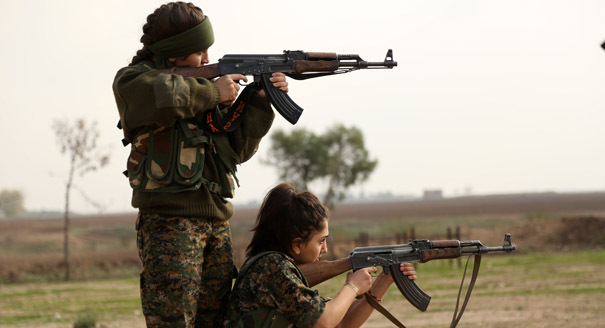 In an interview, Isabel Käser discusses Kurdish female participation in northern Syria. On the margins of a Carnegie conference, Rouba Mhaissen and Galip Dalay discuss a solution to the Syrian conflict. A Carnegie workshop hears Libyans discuss a reform of their country’s security sector. Breaking Yemen further with a militarized U.S. policy will only help AQAP. “Madkhali” Salafists in Libya are active in the battle against the Islamic State, and in factional conflicts. Why local tribal calculations will determine what happens outside Syria’s heartland. Manbij: A Dress Rehearsal for Raqqa? As it becomes possible to take stock of the situation in Manbij and a new administration moves in, the city will be seen as an important bellwether in the war against the Islamic State. While forces loyal to Syrian President Bashar al-Assad have suffered setbacks, recent advances have managed to reclaim strategic territories. If negotiations fail to overcome the divide between rebel factions, the East Ghouta may be heading for a permanent internal split. Four months of relentless Russian bombardment and offensives by the government of Bashar al-Assad and its Shia allies seem to have left the Syrian opposition exhausted. Aron Lund, Editor of Syria in Crisis, looks back on events in Syria in 2015 through the site’s most popular posts. The recent Syrian opposition conference in Riyadh has been met with cautious optimism, but questions remain about the role of a powerful Islamist group and Syria's Kurds. The self-proclaimed Islamic State has recently experienced significant setbacks at the hands of the Syrian Democratic Forces, a Kurdish-majority alliance backed by the United States. Jaish al-Sham: An Ahrar al-Sham Offshoot or Something More? While new rebel factions are common in Syria, the recently formed Jaish al-Sham may serve to bind the ties between Ahrar al-Sham and the remainder of the Syrian armed opposition.